Hope you all are playing well with Android Studio. Yes, I am here after long time to share my research and some useful things for Android Developers. I referred so many blogs and found so many tricks for Android Studio but I am sharing those things which is really useful in day-to-day life of Programming. You may have to know some tips and tricks to be more productive and increase efficiency. Let’s have fun with some useful shortcuts and commands, Hope you will enjoy it! Let’s say you want to close current tab and you don’t know how. You just type: close and you’ll get a proper shortcut / command. If you want to create new Activity, just type Basic Activity and press ENTER. By default there are 5 last copy/paste items. A detailed article about this feature is provided by Bartek Lipinski on Medium. Highly recommended! Let’s say you have an interface. By clicking on the interface’s name and then clicking the Go to implementation shortcut, you will be redirected to classes which implement that interface. It allows you to quickly check and go to a declaration of a class, method or a variable. You will get problem with ubuntu, that is locking screen by use of this shortcut so you can use CTRL+ALT+SHIFT+L for that. It will open dialog for format and optimize your code. The shortcut must be used when a caret is on a text. 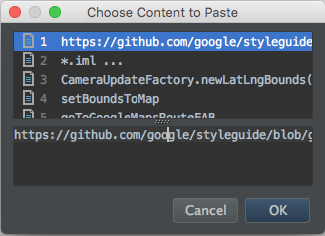 If you use that shortcut globally, the IDE will do Project quick fix (show intention actions and quick fixes). All the Shortcuts are useful in our coding of daily life. Hope you enjoyed. Android, Android New Learning, Android Productivity, Android Studio, Android Studio Shortcuts. Bookmark.